As Congress debates a major overhaul of the tax code, it’s an opportune time to take another look at how Americans’ tax bills compare with those of people in other countries. While cross-national comparisons of tax burdens are complicated and tricky, most research has concluded that, at least among developed nations, the United States is on the low end of the range. 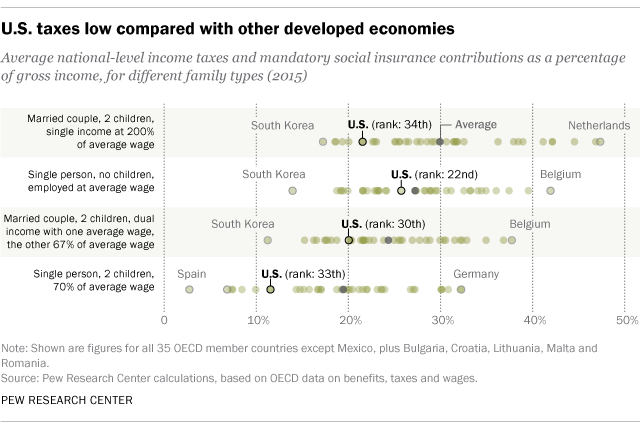 We looked at 2015 data from the Organization for Economic Cooperation and Development’s database of benefits, taxes and wages, which has standardized data from 39 countries going back to 2008 and allows comparisons across different family types. Some of the tricky part of comparing taxes has to do with calculating benefits – not only do the amounts vary a lot from country to country, but some (such as the U.S.’s earned income tax credit) are run through the tax system, while other benefits are themselves taxable (for example, unemployment compensation in the U.S. but not in Japan or South Korea). So we chose to focus on a simple measure of tax burden: national-level income taxes plus mandatory social-insurance contributions as a percentage of gross income. We calculated this for four different families: a single employed person with no children; two types of married couples with two children, one with both parents working and the other with one worker; and a single working parent with two children. In all cases, the U.S. was below the 39-nation average – in some cases, well below. A single, childless American making the average wage in 2015 ($51,509), for instance, paid 25.8% of her gross income in federal income tax and payroll taxes, versus the 39-country average of 27.3%. Such a person living in Belgium, by contrast, would pay 42% of her gross income. An American married couple, both working (one at the average wage, one at two-thirds of it) and with two kids, paid 20.1% of their gross income in taxes; a similar Belgian family would have paid nearly double that rate, or 37.8%. Much of the difference in relative tax burdens among different countries is due to the taxes that fund social-insurance programs, such as Social Security and Medicare in the U.S. These taxes tend to be higher in other developed nations than they are in the U.S. Take that married couple referred to above: In 21 of the 39 countries studied, they paid more in social-insurance taxes than in income taxes. The U.S. had the 11th-lowest social-insurance tax rate for such couples among the countries we examined. Like pretty much everything regarding taxes, there are caveats with the OECD data. The biggest is that our comparisons don’t account for what citizens receive from their governments in either direct or indirect benefits as a result of their different tax structures. We’re only looking at what citizens pay into the system – and even then, just a portion. A recent Pew Research Center report found little support for cutting taxes for high-income households (defined as more than $250,000) or large businesses and corporations. Only about a quarter of Americans surveyed favored lower rates for those groups (24% in each case), while 43% favored raising taxes on high-income households and about half (52%) said corporate taxes should be raised. 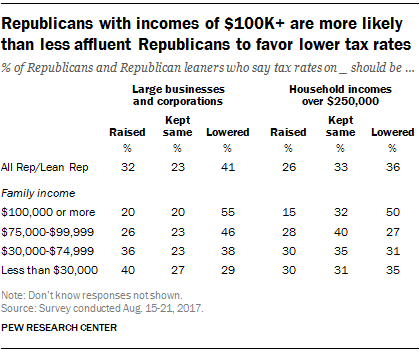 As in much else these days, there was a distinct partisan divide: Democrats and Democratic-leaning independents broadly supported raising taxes on both corporations and high-income households, while the views of Republicans and Republican leaners were more divided – especially by income. Note: This is an update of a post originally published on March 30, 2015, and republished on April 11, 2016.